Mod The Sims - A cow ??? As soon I found this object, I opened it in SimPE and I didn't like it. Test it in the game and I still didn't like it. It seemed to me a simple way to eliminate uni townies. Born to be killed? Then I decided to make it my way. The number 7 in the mod, means that I made 7 versions before I was happy with it. In fact I simply neutralised the original menu and created mine. Now you get a brand new menu and pay attention, it says "No test" in it and it really mean it. You will get the options to : "Grab the Cake - No Test". It means that you can direct a selectable to suicide; the other option is "Ask someone to grab the cake". It means that you can direct whoever in the lot (except selectables) to do the unacceptable. It includes whatever townie or npc. And a bonus: when in milk mode, you will get the option "Milk the cow" as usual, when you can have a family member to milk the cow; but you will get also the option "Ask someone to milk the cow", when you can select whoever (non-family) in the lot. The benefit will be 3 extra life days (not 5). I definitely don't like EA's programmers, but their animators deserve applause. I normally test an interaction to total saturation, I watch animations and the way they are executed for about 10 to 15 hours consecutively. If I still can laugh, I approve it. This time I laughed to burst sickly caughing, so I approved it. I'll use it only in the pre-hoods because my game cannot produce NPCs of any kind, so I don't have any townie, service or not, npcs. Ah, it cannot kill children. They can feed and milk the cow, but kill children is beyond my principles. Basically, the cow can only kill npcs, if they are selected, so the mod will select them automatically before killing them. If you think that kill is bad, well, the cow only produces milk this way, so it is not my fault, blame EA! 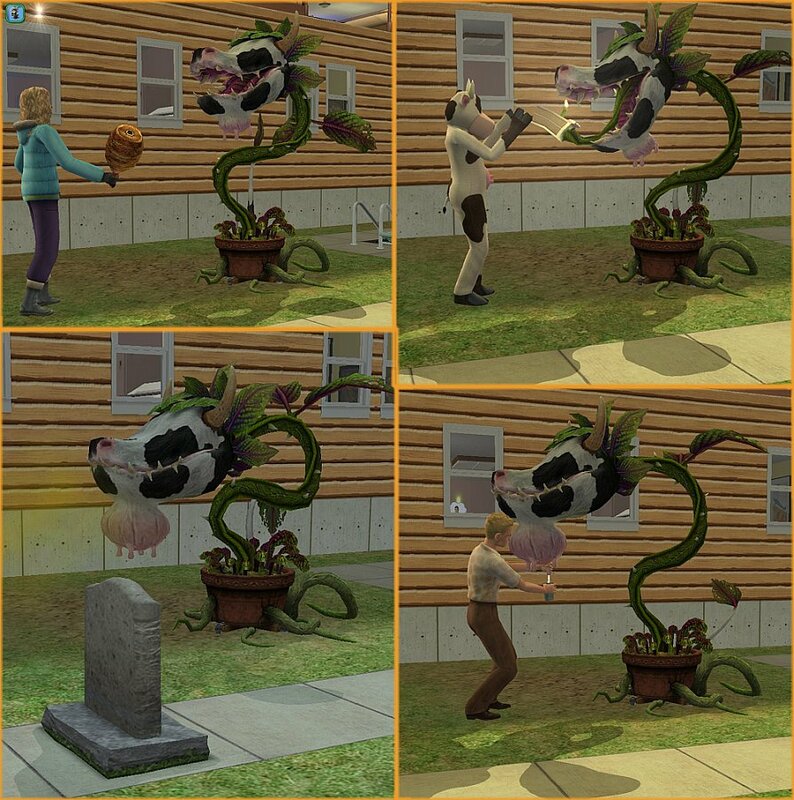 I also limited the interaction that allows dead sims to tease the cow. Now they can only do it if the cow is outside. To avoid it, well, cage the cow inside! It is a reward from the career "Natural scientist" or something that I don't use. It will conflict with any other modification in the cow plant, once the whole interaction is changed. If you know anything that can be included, pm me! I'm not going to do it publically anyway! I used SimPE to make the mod.